« Reviving Dried Out Mascara! Not too long ago while browsing Pinterest for a little inspiration I came across one of many pins for DIY naturally scented all purpose cleaners and I decided it was something I wanted to experiment with. I have pinned multiple DIY naturally scented citrus cleaners and will continue to do so and experiment with them, and of course, I will be sharing my experiences here. Having just finished my first attempt, a naturally scented grapefruit all purpose cleaner, I couldn’t wait to share! It was easy to make, it’s budget-friendly, I love the smell and it gets the job done! As with many DIY projects I have been trying, I experimented a little bit. Most people would have used a larger jar, and more peelings, which would of course yield more product. I did this on a whim, remembering the website I found while I was peeling the one grapefruit we had in the house, and I only had one available mason jar. Three weeks later I was a little unorganized, and I didn’t have a spray bottle ready. I ended up transferring the product briefly into a spray bottle we use to water our house plants, then transferring it back into the mason jar, and that night, I picked up another spray bottle. But sometimes, that’s just part of the fun! 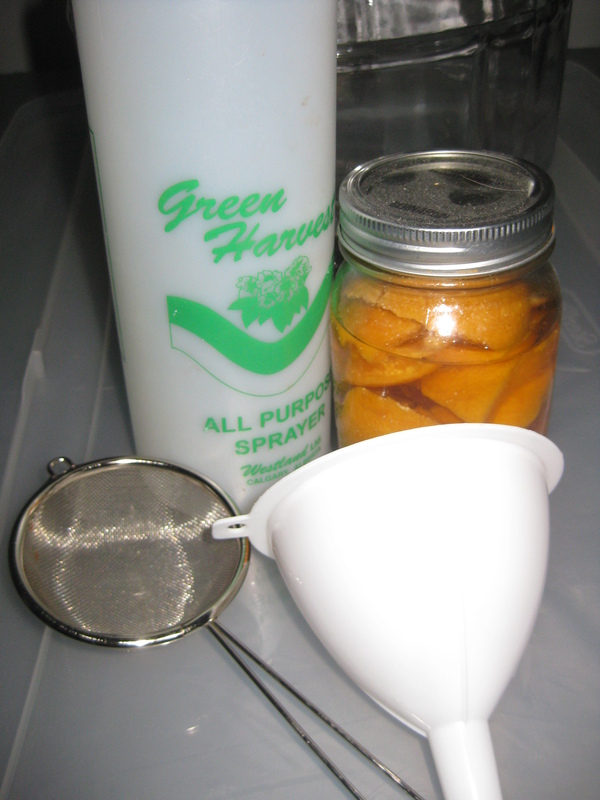 Here’s what I did to make this naturally scented all purpose grapefruit cleaner! Like I said, I will be experimenting more with these, and I will post those to the blog. And don’t be afraid to get inspired and make the project your own – experiment, the risk is minimal. Fill your mason jar with grapefruit peelings. Be sure to get the pulp off of the peeling as it can make your product sticky and cloudy. Then cover the peels with white vinegar. Seal the mason jar and let sit for 3 weeks. You may wish to label the mason jar using painter’s tape, especially if you’re making multiple scents. I didn’t have painter’s tape at the time so I ended up using a post it note that I taped to the lid. It said what the product was, and also what the next step was, as well as the date I had to strain it. Over time, the contents of the jar will look less appealing. This is normal. I was a little unprepared for ‘straining day’ and had to transfer my product into the spray bottle we use for our plants temporarily, wash out the mason jar and then put the strained product back in the mason jar. Half a day later I purchased a spray bottle! The picture above is from what I called ‘straining day’. Using your funnel and strainer you want to strain the liquid into a clean mason jar. The reason I don’t recommend putting it directly into a spray bottle is because before use you’re going to dilute it. Because I was not prepared I had to transfer mine into a temporary spray bottle as I was straining it, then I washed out the mason jar (whether or not it was necessary, I did it) and then I poured the strained liquid back into the mason jar. Because I made such a small amount I will probably only get two batches out of this, but I knew that when I started. Again, you may want to use painter’s tape to make a label for your product. To use – dilute the mixture in a spray bottle (1/3 mixture, 2/3 water), give it a quick shake to combine. Do not use this product on granite or marble surfaces! To see what inspired me to try this, click here! I hope to experiment with a couple of these scents in the near future. If you decide to try this DIY project, leave a comment with your feedback. I’m certainly curious to know what scents people have experimented with. Any creative suggestions? This entry was posted on May 29, 2013, 3:39 pm and is filed under DIY Cleaning Products. You can follow any responses to this entry through RSS 2.0. You can leave a response, or trackback from your own site. I love how simple it is to make. Not to mention it works well and smells great. I’m eager to start experimenting with more scents! Love it! I love that you are so into natural stuff! it’s so much better to use things that have natural, minimal ingredients! Great post. Thanks for following me! Followed you back! I’ll admit, I didn’t expect to turn to natural products. I guess I was worried about being labelled. But you’re right, it’s so much better. Slowly, I’m incorporating more natural products into my life and I’m happy about it. I will definitely be doing more posts like this one! One of the best decisions of my life was to switch over to natural bathroom cleaners. We have a small bathroom and I found myself choking on the fumes of products I previously used.